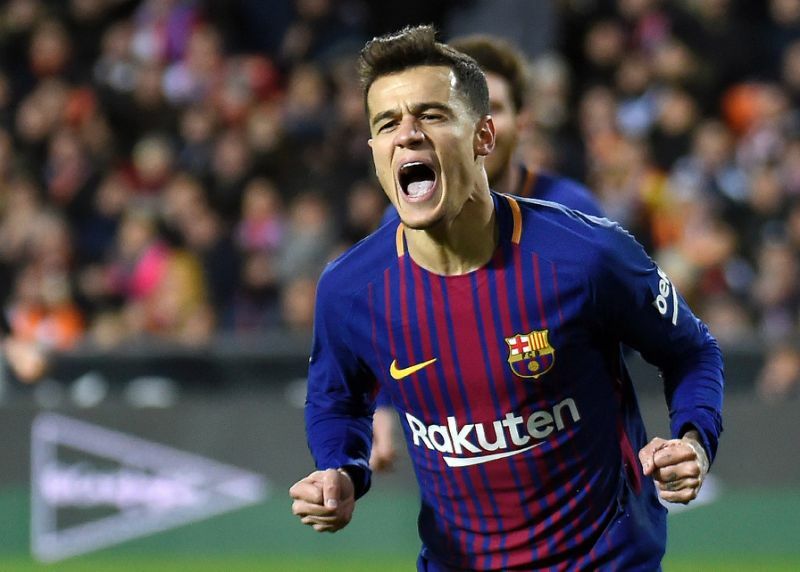 Philippe Coutinho came off the bench to score his first goal for Barcelona in a 2-0 win at Valencia on Thursday that saw his new club ease into another Copa del Rey final. Coutinho broke the deadlock in the 49th minute of the semi-final, second leg at Mestalla, having only come on at the start of the second half. It was the first time the Brazilian had found the net since his blockbuster 160 million-euro ($192 million) move from Liverpool in early January. Ivan Rakitic then swept home the second goal eight minutes from the end as holders Barcelona secured a place in the final for the fifth season running. Winners of the trophy in each of the last three campaigns, the Catalans will face Sevilla in the final set for the weekend of April 21 and 22. Sevilla beat Leganes 2-0 on Wednesday to go through 3-1 on aggregate. "For me it is my first final, so it is a very special moment," Coutinho told Spanish TV station Gol. "I am very happy. I had been searching for this goal in my first few matches. Today I got it and it helped the team get through to the final." Valencia were hoping to reach the final for the first time since they won the trophy under Ronald Koeman in 2008, beating Barcelona in the last four on the way. Trailing 1-0 from the first leg after Luis Suarez's strike separated the teams at the Camp Nou last week, Valencia almost levelled the tie on aggregate early on. However, Rodrigo's header beat Jasper Cillessen in the Barca goal only to come back off the bar. Lionel Messi had come close on a couple of occasions for the visitors in the first half, but it was the introduction of Coutinho that swung the tie decisively their way. Barca coach Ernesto Valverde sent his recent recruit on in place of Andre Gomes, and Coutinho quickly made his mark, turning in a Suarez cross at the back post. Valencia had centre-back Ezequiel Garay carried off and then saw Cillessen make an incredible save to deny Jose Gaya from point-blank range in the 74th minute. They were condemned to a sixth straight defeat in all competitions as Suarez pounced on a Gabriel Paulista error and set up Rakitic to make it 2-0 on the night. The only slight setback for Barca was the sight of centre-back Gerard Pique coming off hurt late on, with Colombian international defender Yerry Mina coming on for his debut.